Want to Know Where to Start or Where to go Next? Find Out Below! Are you thinking of ditching the day job and hitting the virtual tables for 12 hours at a time? Have you thought about how you’re going to go about it? Are you perhaps daunted by the whole online experience in general? 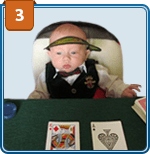 Perhaps you’re 18 and might not be sure if online poker is even legal where you live. If you’re looking to get into online poker for the first time and want to invest some serious time in it, let us take you by the hand and take you through the first steps through the life of an online pro. What do I need to get started online? 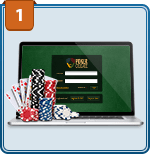 Getting started at a top online poker site today is as easy as coming up with a unique username and safe password and providing your name, address and email. 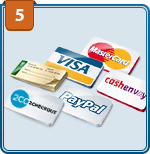 Some sites ask you to come up with a 3 or 4-digit PIN code as an added layer of security. Poker rooms – particularly post-Black Friday when security and legitimacy is paramount – want to make sure everything is above-board and that everyone playing on their sites is a legitimate user. So double check that everything you input is accurate before you finish and get playing at the tables. Most major sites require every new player to confirm that they are of legal age to play online poker in their local jurisdiction. Hang on - is online poker actually legal in my country? That question largely depends upon where you live. In some, like Canada and Australia, only the operating of online poker sites locally is frowned upon while the actual playing of poker isn’t. In the UK online poker is legal to anyone over the age of 18, while in some European countries like France and Italy recent legislation was passed governing online gambling. As of 2019, French and Italian online poker players can only play on regulated poker sites catering solely for residents of those countries. In the United States online poker is slowly being regulated on a state-by-state basis where it remains in a legal limbo on a countrywide level. As of 2019, Nevada, Delaware and New Jersey offer their residents legalized online poker. For players elsewhere in the US they’re largely playing in something of a grey area. However, to date no player has been arrested for playing online poker. 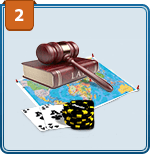 If you want to move to a country where online poker is legal, sites like www.pokerrefugees.com have even been set up to help Americans or those living in restrictive jurisdictions relocate to countries with more favorable online poker laws. The legal age of gambling differs wildly from country to country and in some countries from region to region. In the UK it is 18, in Canada it varies between 18 and 21, depending on where you live (but in general it is 19), while Americans playing at legal poker sites have to be 21. The legal gambling age in Australia is 18, and that age limit is also used in their cousins across the water, New Zealand. In Europe, meanwhile, Germans can gamble from 18, or 21 if you live in specific regions. Italians have the luxury of gambling online from 18, as do those in Spain. What ID do you need to show to set up an account? Age verification documents may be requested upon signing up for an account to comply with the site’s jurisdictions. Don’t worry – as long as you’re old enough to play, the moves are designed to improve the security of your account. 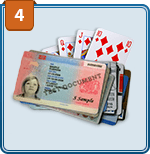 Documents vary from country to country but generally a photo ID like a passport or driver’s license is sufficient. In some countries these will only be needed when you make first withdrawals (see below). You will often need to prove your home address also, so make sure you have a bill or bank statement handy to fax over. What do I need to withdraw cash? Your cash-out options are based on where you live, rather like your ability to enjoy online poker in the first place. When you want to make a real-money withdrawal simply head to the Cashier tab and hit the Withdraw button. Depending on what method you’re using (debit/credit card, eCheck, Western Union) fees and cash-out times can vary – and often wildly so – so make sure you have a proper handle on all the costs involved before you first make a real money deposit. A 2-3 day wait on initial cash-outs while extra anti-fraud checks are carried out is not uncommon. Do I need a math degree or years of experience? 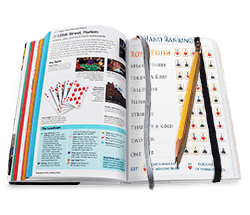 While there are certainly many big pros out there who have come from a math background – and who utilize complicated odds and Game Theory in their games – it doesn’t mean you can’t enjoy a profitable poker life without a Math degree. If you can build up a good working knowledge of pot odds, expected value (EV) and equity, however, you’re halfway there. Without signing up to expensive training sites (see below) you can try a trial at a good training website who often carry thousands of videos and will offer free-to-try trial periods. 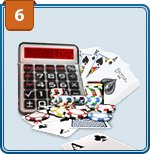 Simply try a couple of videos on basic poker maths in order to get a good handle on simple odds. If you’re going to be using a HUD (Heads-up Display) – and you should seriously consider getting your hands on one if you want a fruitful online experience, you’ll need to get a grasp on basic percentages like VPIP (Voluntarily Put Into Pot %) and PFR (Pre-Flop Range Percentage). Those two stats alone will give you a decent gauge on how your opponents bet at your table over the course of many hands. Finally, getting hand experience in will always improve you as a player: you can better assess situations, fix leaks in your game and ensure a better profit over the long-term. Remember, even the best players in the world are constantly learning. So you’ve set up a new real-money account and you have your client sorted. What about some hardware? While we don’t necessarily recommend forking out thousands on new equipment it’s sensible to get a powerful PC (and stick to PCs while Mac sites still catch up) and as big a monitor as you can afford. If you’re serious about making a profit playing online poker you’ll need to learn to multi-table, and that’s only possible using two monitors linked up. Some pros will use one 24-30” monitor for their tiled games and another for social media, forums, emails etc. Make sure you don’t get distracted with surfing and emailing while playing and you’ll be in for a happier time overall. 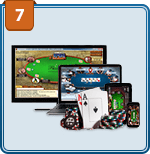 Although expensive, the Lenovo Horizon All-in-One is a great option for desktop and on-the-go poker as the screen detaches to become a touchscreen tablet – perfect for playing one of the latest real-money mobile poker sites. As with anything, you get what you pay for, and ensuring you have the best kit available will reap benefits. It’s probably worth saying that you should get your hands on the fastest – and most reliable - Internet connection you can find in your are so you don’t experience any logout problems at crucial moments. OK, any other bits I need? If you’re going to be playing cash games (and if you’re thinking of grinding it out at multiple tables over time, cash games are the way to go) you’ll need to not only buy yourself a HUD (heads-up display) but also sign up to a poker site that allows them to be used. 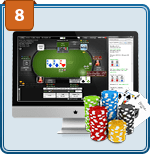 HUDs like PokerTracker or Holdem Manager sit on your poker software and track the other players at the table, in turn analyzing their play and displaying vital stats such as VPIP and PFR. The software is always being tweaked and improved, and although some major real-money sites are making moves to ban the use of these bits of kit take advantage and make hay while the sun shines. Yes, and in 2019 there are more places than ever to get the latest tips, advice and coaching. You can even take advantage of some staking to get your bankroll moving in the right direction. CardRunners.com has over 40,000 articles, videos and blogs from players who’ve been there, done that, and got the tee-shirt. You’ll find plenty of beginners’ articles for free when you visit the site too, but if you want to take the plunge and sign up subscription costs $275 for a year. 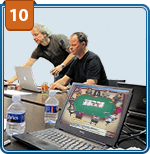 Also check out some of the videos on sites like PokerVT.com, where Daniel Negreanu is heavily involved, and PokerVIP.com which carries some seriously good strategy videos. Sorry, did you mention staking? Yes. There are dozens of sites out there who will not only train and coach you but also pay your way online. The methods used from site to site are different as some will take 50 percent of your profits while others require to pull in a 9-to-5 'work day' in their offices, learning to grind 'on campus'. Check out: Stake Me to Play (www.stakemetoplay.com) – a new set-up that stakes players into SNGs, MTTs and cash games online. To break up the monotony of playing at home in your pyjamas for 12 hours, they have physical offices in London, England where players can mix and share tips. Meanwhile, here on CardsChat.com, we have a staking service right on the forum, moderated by trusted, long-term members. 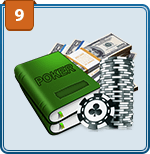 Check out the staking forum here - Poker Staking. And while we’re on the subject of CardsChat, it’s worth recommending joining a major online poker forum like ours (Join CardsChat here). We can provide invaluable sources of news, information, and advice.